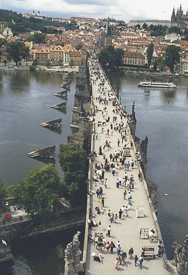 The St. Charles Bridge is a stone Gothic bridge that connects the Old Town and Mala Strana in Prague It was actually called the Stone Bridge during the first several centuries. Its construction was commissioned by Czech King and Holy Roman Emperor Charles IV and began in 1357. It is said that egg yolks were mixed into the mortar to strengthen the construction of the bridge.